You'll know by now that we champion all that is hand made and independent! 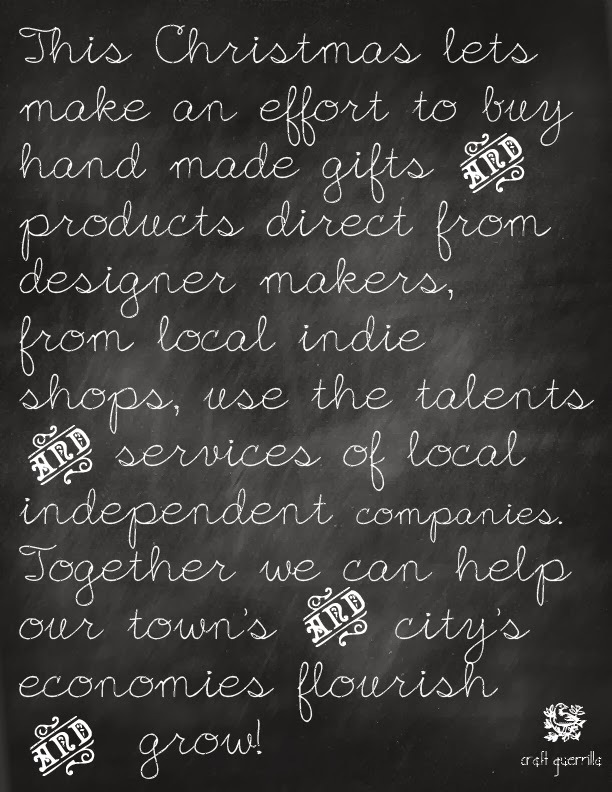 By supporting your local economy -buying from small indie makers, bakers and sugar shakers!- we believe that the possible outcome is a positive one and that you'll be helping transform your community into a thriving and prosperous mini economy! This is one campaign that we really want to see become a norm and not just an alternative way of living. Please download and share on your page and join the campaign! It's all about being more localized, self sufficient and thoughtful with what you buy! Let's give the mass produced corporates a run for their money... High Street aren't all bad but do you really want to fund slave labour? We don't want to lay down the "guilt" card but we all know the extreme poverty that the majority of workers live in which are associated with cheap mass production and that is something very difficult to ignore! Though we are aware that people need to buy cheaper products...well I for one can not say that I have never bought anything from Primark...because I have! But the important thing is to demand change, pressure companies to check their suppliers and where possible to be supportive of your local makers. 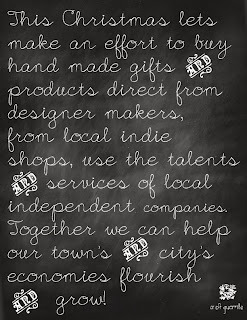 So for this Christmas please be aware of any local independent companies who offer services or any designer makers who sell at a craft fairs! They too are working there little fingers to the bone to make great, original gifts for you and your family to enjoy! It's not easy living solely off what you make and as a designer maker I can vouch for that. But it ain't all bad... consumers are more and more aware of the virtues of buying hand made goods and are definitely not hoodwinked by those naughty companies who use cheap labour and substandard materials. So remember check out your local talent... you might just be amazed at the variety and quality of products and services available!